Furkids is one of the only shelters in Georgia that welcomes children of all ages to volunteer in many different capacities. If you are interested in any of the following opportunities, please fill out a volunteer application and/or contact our volunteer manager at volunteer@furkids.org. We also encourage children to complete community service projects for school or church with us. We welcome the involvement of young people in our fundraising efforts. 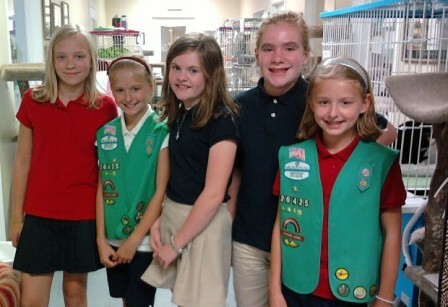 Children of all ages can initiate a number of projects to raise money or goods for the shelter. From dog washes to lemonade stands and garage sales, children can have an important impact on the day-to-day expenses of caring for the homeless animals in the Furkids program. We have a wish list provided online if you would like to create a supply drive. Children younger than 16 are welcome with a parent or guardian present. The Furkids shelter has about 200 cats living in a large, cage-free environment that feels more like a day-care center than an animal shelter. With its brightly colored rooms, cat trees and shelving systems, the shelter provides cats and visitors with a happy and comfortable experience. Responsibilities include working in the rooms to provide the cats with fresh food and water, cleaning litter boxes, and mopping the floors. In addition to cleaning the rooms, there is ample opportunity to engage with the cats by petting and playing with them and providing them with much needed human contact and TLC. The Furkids Read to Cats program is designed for volunteers under 16 years old who have reading requirements or just like to read. The program helps children with their reading skills while also helping to socialize shelter cats. 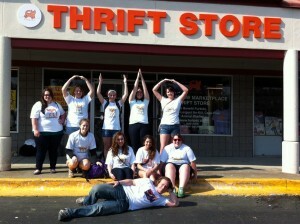 This is an opportunity for teens to work on the fundraising side of Furkids at the Furkids Thrift Store, our 7,000 sq. ft. store that generates revenue to help cover the operating expenses of the shelter. Volunteers will be responsible for receiving and sorting incoming donations and staging them onto the sales floor and/or tidying the merchandise on the display racks. This is a great opportunity for young volunteers that like working in a retail environment. Furkids/SmallDog Rescue has lots of dogs available for adoption. They can meet potential owners on Saturdays and some Sundays at one of our adoption events. This opportunity is for young people that are comfortable handing dogs in a bustling retail environment. Dog handlers are responsible for walking the dogs and making sure they are secure at all times. There is some interacting with the public. Anyone between the ages of twelve and fifteen may volunteer if accompanied by parent or guardian. Young people and their families are needed to provide temporary loving homes to Furkids program dogs and cats. Furkids provides all the medical care, food, and marketing to facilitate an adoption. The foster home experience is great for children of all ages – as it teaches sharing in responsibility and encourages kindness and a nurturing spirit towards homeless animals in need. This opportunity also increases an animal’s chances to be placed into a lifelong, loving home. Furkids will match the most appropriate foster animal for your family, whether it be a litter of kittens, a dog that needs lots of interaction, a laid back quiet cat, an older dog, etc. The timeframe for fostering varies according to availability and can be as short as one week to several weeks. Young volunteers are needed to help pet owners stage their dogs (and other pets) with Santa for a Christmas keepsake photo. This event takes place at select Furkids metro-Atlanta adoption centers. Helpers are needed the first three weekends of December. This is an important fundraiser for Furkids and a great opportunity for groups of young volunteers that enjoy working together. Several helpers are needed at once – people to welcome, people to stage pets, people for photographing, and people for assembling the photos – oh, and dads to fill in as Santa! We also participate in gift wrapping the during the holiday season at select Barnes & Noble stores around town.